Topical Series #1: Am I Doing It Right? Ask ten different ballroom dancers how to do a basic Rumba box, and I bet you’d get ten different answers. Yes, the basics would be the same: the timing, the direction of the steps for the man and lady, that there should Cuban motion in the hips, for instance, but beyond the obvious “rules” listed in a syllabus, there are a myriad of ways a person could perform the same step. Who should I trust? Who is right? How will I know if I’m practicing a good habit or a bad one? Let me make it clear that I don’t have all the answers, but here’s how I’ve come to think about this particular dancing issue. 1) Just as there is a “right” way to perform a tendu in ballet, there is a “right” way to dance ballroom steps, but at the same time, there perhaps there is more than one “right” way. One thing that would make a step “right,” for instance, would be that it is done in such a way that it doesn’t cause injuries. It would be in proper anatomical alignment. It would create aesthetically appealing lines in the body. You’d be on balance doing it. You’d be in control. But since all bodies are different, they will perhaps have slightly different alignments, create slightly different lines. The same steps done side by side with another person may look completely different on one person’s body than the other’s. 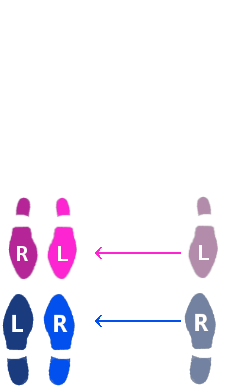 It’s probably most important to be in sync with your partner in ballroom, and to aim to generate identical lines with one another. 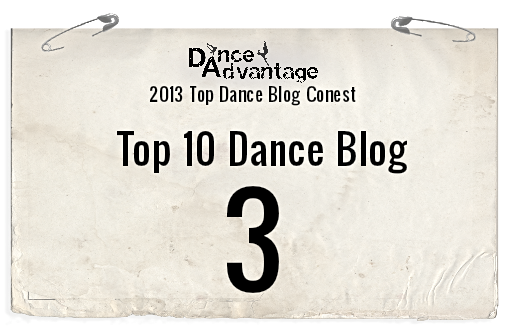 2) Each dancer is a creative being who breathes life into movement. Is there a “right” way to do that? I think perhaps there are more or less authentic ways of embodying a dance, and perhaps people connect with themselves, their partners, and their audience to different degrees. Then there is the personal preference of those watching. But to say there is a “right” or “wrong” way of “being” defies logic. 3) Part of what I’m sussing out when I’m working on a step is how I, personally, am going to dance it. I can tell you that the way Marietta does a Samba is very different than how Inna does it. It’s because of who they are. I am on a hunt for who I am as a dancer. What movement comes naturally to me? Which one causes me to express more? What story am I telling with my movement, my body, the interactions between me and my partner? Am I being pouty, or sad, or exuberant? It’s all about the step but it’s not at all about the step, you know? Doing the steps with proper technique frees the dancer to express, which is really what dancing is all about. 5) Use the mirror. I’ll admit, I still have a difficult time with this one. The mirror can be an amazing tool to develop my dancing, but it can also be a weapon I use against myself. When I’m having a good relationship with the mirror, I can use it to see if I am moving like my professional partner. If I am not matching him completely, then I will know something’s not right. I often don’t know exactly what tweak I need to make (if I did, then I wouldn’t be mismatching him) but at least if I can observe the feedback I’m getting by looking in the mirror I can be aware that something is amiss and ask a question. 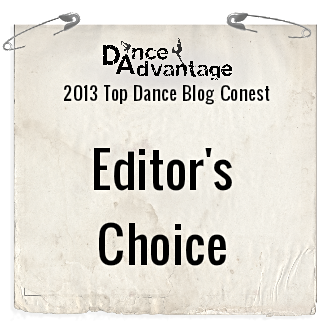 So, is there a “right” way to dance ballroom? I think the answer is yes…and no. Like most things in this world, a simple black and white answer doesn’t cut it. It’s not a dualistic question, but rather a paradoxical one. I think both ends of the paradox are true in the proper context. Yes, there is a “right” way to do ballroom steps, according to a syllabus and in proper anatomical alignment. But no, there is no absolute one “right” way to express through the movement. Part of what makes ballroom dancing so wonderful and beautiful is the uniqueness each individual dancer contributes and the synergy created by partnership. As for determining whether you are doing something “right,” well, you’ll have to use your own discernment. For me, it’s important to receive information from a source I respect and trust. I remain open to the feedback from everyone, from coaches, to fellow students, to my personal instructor, but filter it in level of importance. I use the mirror to see how I am moving compared to my partner, the professional dancers, and fellow students. I watch a ton of videos of professional dancers performing so at least I have an idea of what things are “supposed” to look like. If I were really disciplined, I could even look at a syllabus (but let’s face it, I’m too lazy for that! Plus, I tend to be a visual learner. Reading about the details of a step in a syllabus seems like it would be a tedious task and difficult to envision – like reading the standard for a breed of dogs and then trying to picture the canine using only that description). So now it’s your turn! What do you think? Is there a right way to dance ballroom? How do you know if it is right? I’d love to hear your thoughts. This entry was posted in Ballroom Topic Series and tagged Am I doing it right?, ballroom, ballroom blog, ballroom dance, ballroom dancer, ballroom dancing, dance, Dance Syllabus, dancer, dancing, DVIDA, How do I know if I am doing it right?. The only thing that I would add to it is…”right” will vary, depending on where you’re dancing, and what your goals are…but you can never, never go wrong if you dance with joie de vivre! Dance with love, and with joy–and remember that each dance–however complicated–is telling a story…and you are a *performer* who is telling a story with a partner, using only your bodies–no words. At the local swing club I used to dance at, on Monday nights, the band would mix up swing dances with the occasional slow, bluesy “schmooze” dance. (I’ve no idea if that’s a real dance, or just something unique to Johnny D’s–but it’s pretty much a dance where you’re glued together from the waist to the knee, a bit Dirty Dancing-ish, but more bluesy.) And there was one tiny little white guy there, with a big ‘fro, who could schmooze like nobody’s business. One night, we schmoozed, and it was quite steamy…and at the end of the dance, we were actually unable to separate for a few seconds, because somehow, in the course of the dance, our two vests had gotten buttoned together! Ahhh- not everyone has that ability! I WISH I could dance like that!! I dance from my head – and i love dance – but it is not natural to me – and with my physical challenges, it isn’t as easy to let go and feel – so I have to think to dance. I am envious of people who can live in the dance – If there were a way to learn that I would – but it has to come naturally and it isn’t natural for me. So for me – there are “right” steps or at least steps to learn – and they may have variations – but always patterns and options. I’m chuckling over your response, Speaker–because I’m the opposite of you–in that that’s the ONLY way I can dance, really! I have dyscalculia–sort of dyslexia, only with numbers–and aside from being horrid at math, it also affects my ability to understand dance moves (or any unusual body moves, really), and to learn them. I was a wannabe dancer for years, being fantastic at square dancing (where someone tells you what to do LOUDLY! ;)) and awful at everything else, until I discovered ballroom…where all I had to do was get over my desire to lead, and learn to follow even remotest suggestion coming from my partner’s body. And don’t even TALK about switching to the lead, instead of the follow role–that involves WAY too many mental gymnastics for me!! LOL – perspective huh? I watch people who dance like you and Stef with awe and envy! I’d love to be able to “let go”. I used to know a judge who also came to our studio to coach and she knew me well. When she was judging and I’d go by her she would call out “are we having fun yet?” because I never smiled on the floor! LOL I tried to explain to her I was smiling on the inside. I just don’t have that dance smile or presence – I think when I dance because I have to work at it. None of it comes naturally. But I still love every second of it!